Previous version Clash Royale 2.0.2 apk for Android will help you to downgrade or install older app easily. This is one of the best Strategy apps. Prior to the battlefield, in the main menu, there is a menu deck, where on this menu we can set our troops will plunge into the battle later. So if in the game CoC we need to collect elixir to recruit troops, in clashroyale we only need to select the troops, so no need to “training”. But unfortunately we can only carry 8 types of troops, not like the old game which can carry various types of troops. Well after set who will descend into battle, it’s time we find opponents. Opponent to be faced are random players, which were level and its ability to be customized. Interestingly, because this game is based Real Time Strategy, the opponent we face is also real time. So we are not against the AI, but the fellow players who are hungry for victory as well. The battle system in the game is quite simple, we only have to bring our troops by way of slides, in contrast to CoC that need to touch the screen only. Different from Clash Royale is we can not necessarily just the troops. This is because each force requires a different elixir, and even then we only provide a maximum of 10 elixir which continues to fill every second with the number 1 elixir per second. So the war is necessary strategies, which take precedence troops to go down to the battlefield. How to Play Clash Royale game? There are three main buildings, namely the main castle and tower. 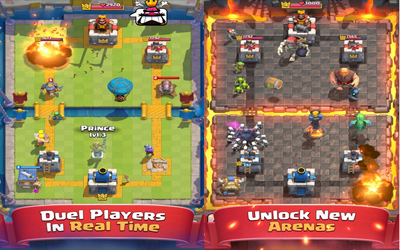 Each building is destroyed, will get 1 crown, which is used to determine who wins. Interestingly, there is a shortcut to win this game, when you can destroy one tower, the troops could directly strike an opponent castle, which if castle is destroyed first, we will automatically get 3 point to win the crown without destroying the whole. If we win, we’ll get a chest containing all kinds, from gold, until the card to increase the strength of our troops. Talking about troops, we can improve (upgrade) the troops when we have had a number of cards which are required, for example to upgrade Giant from level 1 to level 2 need two cards, so we must find the card, which can be obtained from the chest that we can win the war, or bought with gold. The other way is to ask through the Clash Royale clan, so we are just waiting for donations from friends in the clan. This game is arguably better, especially as already described, it is real time. With graphics that could be considered slightly better than Clash of Clan, seems Supercell did not want to leave the shadow of Clash of Clans, so they created a similar game but with seasoning gameplay more interesting.